Preheat oven to 350 degrees and line your cupcake pans with cupcake papers. In a bowl place strawberries and sugar and let set for a few hours till juicy. Place berries in blender and purée. Reserve 3/4 cup of purée for cake the rest you will use in your cheesecake filling and frosting. In a small bowl mix milk, purée, eggs and vanilla. In bowl of mixer place flour, sugar, baking powder and salt mix on low till combined. Add butter mix until looks like crumbs. Slowly add wet mixture and beat on medium for about 1 minute. Scrape sides and continue to mix about 30 seconds. 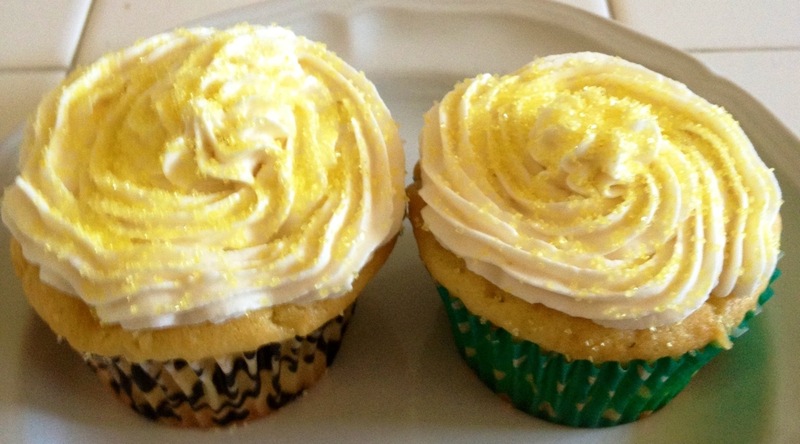 Fill each cupcake paper with 1/4 cup batter and bake 17-20 minutes. Cool 10 minutes in tins and then remove and cool completely. Beat cream cheese till fluffy add cool whip and purée till you get your desired flavor and consistency. Batches of strawberries differ so amounts of purée will differ. Sorry!! 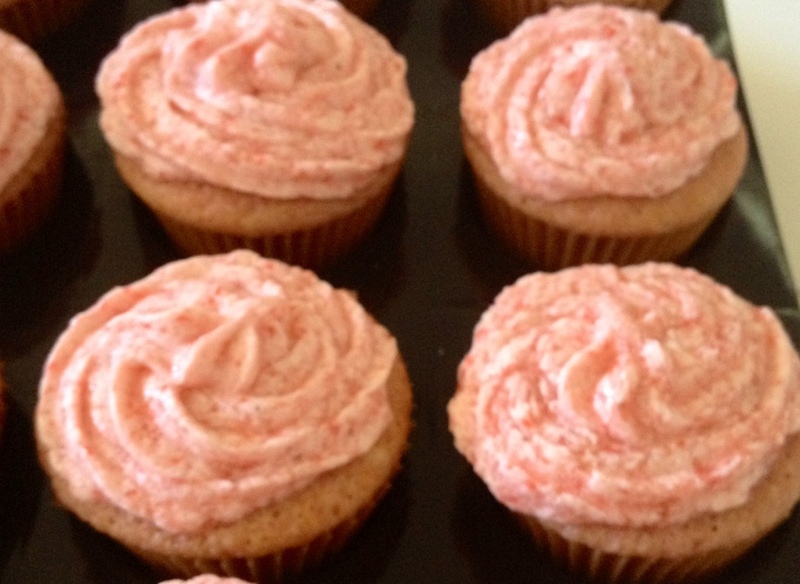 Preheat oven to 350 degrees and line cupcake tins with cupcake papers. In bowl of mixer add butter and beat until fluffy about 3 minutes add sugar and continue to beat another 3 minutes. Add eggs 1 at a time and beat thoroughly after each addition. Sift flour and baking powder together. Add to butter mixture 1 cup at a time alternating with milk, ending with the flour mixture. Add vanilla and lemon extract and mix till blended. Fold in white chocolate. Place in prepared tins filling each liner with 1/4 cup batter. Should make 24 cupcakes. Bake 17-22 minutes until toothpick inserted in center comes out clean. Cool for 10 minutes in tins and then remove from tin and let cool completely. Mix sugar, cornstarch, salt and water in a medium sauce pan. Heat on medium high, stirring to a boil. Reduce to low cook 2 more minutes. Remove from heat. Beat egg yolks in a heat proof bowl. Add 1/4 cup of hot mixture to eggs, stirring. Add a little more hot mixture and continue stirring. Add egg mixture back to pot. Place pot back on stove on medium high heat, stirring to a boil. Reduce to low cook 2 more minutes. Remove from heat. Add lemon juice, zest and butter. Stir till butter melts. Pour half of mixture in a bowl and let cool to use in frosting. To the other half add white chocolate chips and stir till melted. Set aside to cool, this is your truffle filling to fill your cooled cupcakes with. In bowl of mixer add sugar, vanilla and whipping cream. Beat until soft peaks form. Add reserved lemon curd mixture and continue to beat until stiff peaks form. These need to be refrigerated until ready to serve. Mushrooms optional fresh or canned your choice. Brown ground beef with onion and garlic, set aside. In the same pan you browned ground beef add tomato purée and sauce. In the purée tomato can add hot water and dissolve beef and chicken base,Add to tomato’s. Add rosemary. Heat until hot. Add browned meat,onions and garlic to sauce. You can also add the mushrooms if you chose, and let simmer at least 1 hour. Prepare 1 springform pan by lining bottom of pan with parchment paper and lightly spraying with nonstick spray. In a small bowl add crumbs and sugar, stir. Add butter and stir till all crumbs are moistened. Place in prepared pan covering the bottom of pan and 1/4 inch up sides of pan. Place in freezer. In bowl of mixer add cream cheese, beat on medium until fluffy. Add sugar, cornstarch and vanilla continue beating on medium until combined well. Turn mixer down to lowest setting and add eggs one at a time, stirring till just combined. By hand stir in sour cream, do not over stir. Pour into prepared crust and bake for 75 minutes. Remove from oven to rack. Cool 15 minutes, run knife around edges and continue cooling 45 minutes. Then add topping and place in fridge at least for 4 hours. 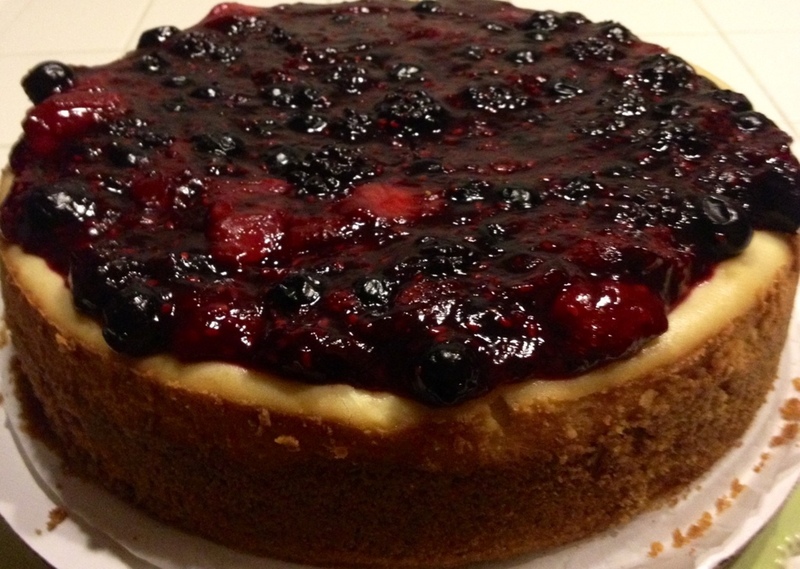 While cheesecake is cooling, add berries, sugar, water and cornstarch to a sauce pot. Cook over medium high heat. Bring to boil and cook another 4-5 minutes. Remove from heat and let cool. Before placing cheesecake in fridge top with berry topping and place in fridge. Preheat oven to 325 degrees. Line the bottom of a 9inch spring form pan with parchment paper and lightly spray with nonstick spray. Set aside. Mix all together in a bowl until crumbs are moistened. Place in prepared spring form pan and 1/4 inch up sides of pan. Place in freezer while making cheesecake batter. 2 whole vanilla bean pods. 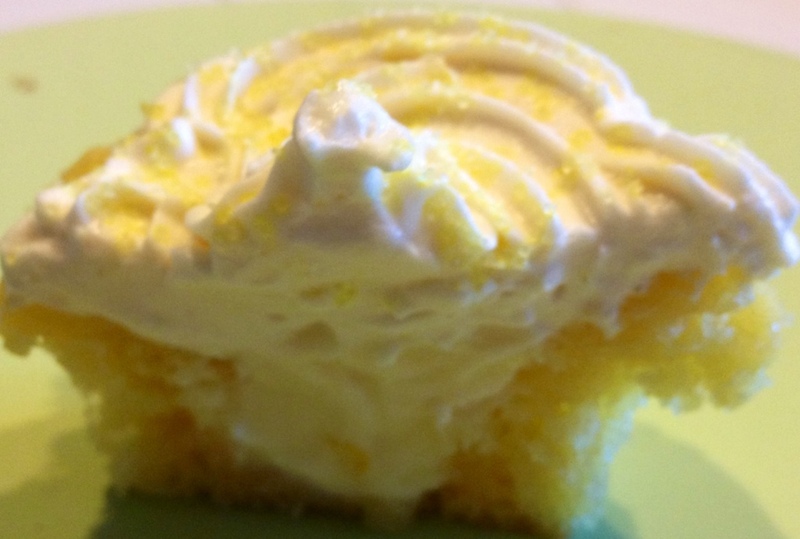 Place cream cheese in bowl of mixer, whip until fluffy. Add sugar, cornstarch and vanilla, beat until combined well. Add eggs one at a time mixing on lowest setting just till combined. Add vanilla bean scrapings to heavy whipping cream and stir together. By hand slowly stir in whipping cream to batter. Pour batter into prepared crust and bake at 325, just until center is set about 75 minutes. Remove from oven place on rack. Cool 15 minutes, run knife around edge and continue to cool another 45 minutes. Bring to a boil on medium high heat then continue to cook 4-5 minutes until thickens. Remove from heat and cool along side cheesecake. 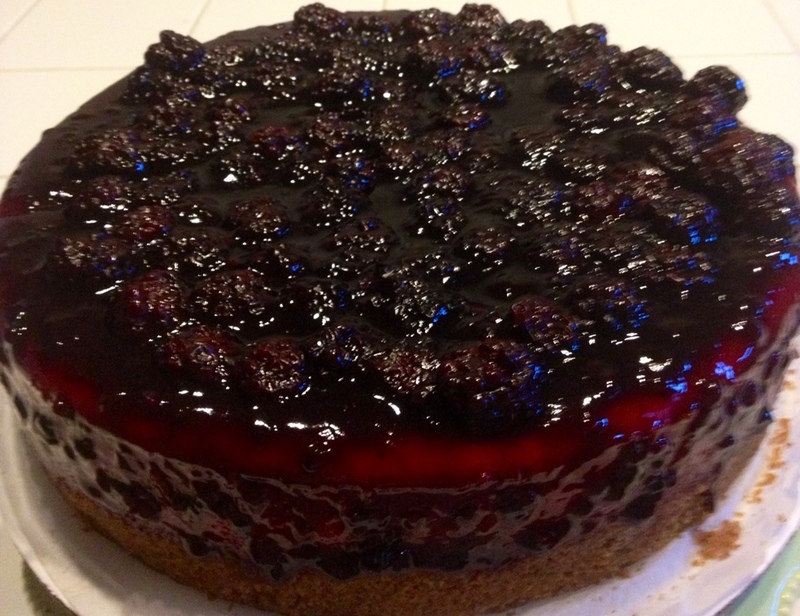 After 45 minute cooling period for cheesecake place blackberry topping on cheesecake and place in fridge for at least 4 hours.